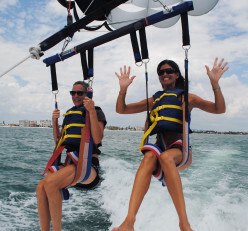 Our two full service water sports locations on Fort Myers Beach each include WAVERUNNER RENTALS, WAVERUNNER DOLPHIN TOURS, PARASAILING AND PADDLEBOARD RENTALS. 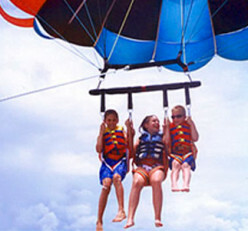 One is located on the beach behind The Sandpiper Gulf Resort and the other behind the Wyndham Garden Resort. Directions to both are listed below. Parking is allowed for our waverunner and parasail patrons at both locations. The Wyndham Garden has inexpensive paid (often free) parking available to the public as well as a beach access! Hotel Guests and beach walk up customers are welcome at all locations. In addition to our two full service water sports locations, we do Cabana, Chair and Umbrella Rentals at several other resort locations on Fort Myers Beach. Come check us out if you are staying at or near any of the following. Our beach kiosks can always be found by looking for our Signature Yellow Smiley Face Flags!